Hang around P.U.D. long enough and you will eventually hear someone allude to "those basement days." You might wonder what a basement has to do with a dance studio. The answer: Picture Us Different Dance Studio was born in a basement. The basement belonged to a small house on Virginia Ave. in Chicago where a young girl named Ann dreamed big dreams: dreams of dancing and making dances and teaching dances. I sat down with this girl – all grown up now – and asked her to tell me what it took to make her dreams come true. Sitting in her office filled with costume cartons, dance bags, dance shoes and a desk covered with "to do" lists, Ann began our conversation with a most astonishing fact. "I was 12 years old when I taught my first class. I was in charge of teaching a roomful of 3 and 4 year olds. I had no assistants and I had to make up my own lesson plans and dances." Ann had been taking dance at the Herrstrom Dance Studio in Chicago when the director asked her to take on this formidable task. "I absolutely loved it. I knew right then that my destiny was to be a dance teacher." Three years later, the first class of the Terschl School of Dance consisted of Ann's sister, Lisa, and Lisa's friends, Shannon Noble and Dina Battaglini. The "studio" was the Virginia Avenue basement. The seed had been planted. What did Mom and Dad Terschl think about their daughter's ambitious enterprise? "They basically just let me do my own thing, though they did like to come down and watch us. And they always gave me their support." Even at that young age, Ann knew that three students do not make a school, so she composed a flyer and walked around the neighborhood putting them in mailboxes. It wasn't long before the kids came running. The place to be after school was Ann and Lisa's –in the basement. "Other than the announcement of the opening of the Park Ridge studio, that flyer was the only advertising I have ever done." The first recital, "Fancy Footwork", took place at River Park in l987. Ann was just 16. She made all the arrangements: booking the venue, designing the program and costumes and making the "Donations" box. There was just one problem. "I didn't have enough dance numbers! I had to ask some friends to fill in so we would have a half-hour show." She got her performers and she got her audience. About 50 people showed up to witness the historical first of Ann's famous productions. The little studio started to grow. Word of mouth brought new students to her basement. " I was also taking class at a studio in Arlington Heights and word got around about my basement studio and girls were coming in from the north suburbs to dance with us." Soon Lisa was teaching. Ann describes their dance space: "It was not even as large as our Studio 3. When we jumped we had to be careful not to knock out the ceiling lights." The house had only one bathroom. "It was crazy – girls racing up the stairs in their tap shoes with our five dogs running around!" Annual recitals were now held in a larger space, Horner Park. Along the way, the Terschl School of Dance became Picture Us Different. Why the change? "Everywhere we danced people would comment on how unique and different our choreography was. So we decided we needed a name that would better reflect who we were and what we did". Shannon came up with Picture Us Different. Ann also started entering her dancers in competitions. "To raise the competition entrance fees we would hold bake sales. All our neighbors came and bought the cookies and cakes." Ann's face warmed at this sweet memory but quickly became serious. "There was a core group of five of us. We'd show up at the competition in our unflashy warm-up clothes, while other studios brought in dozens of girls all dressed alike in their shiny black satin studio jackets with the pink lettering, and my girls felt kind of down until we started winning trophies, which we did in every event we entered. Then the other groups noticed us. Unfortunately, they snubbed us. This happened time and again. But I always told my girls to be gracious to all of them. Smile and say something nice." Ann realized that it wasn't just about dance; she felt a responsibility to build character in her dancers, too. There was also the problem of plagiarism. ("It still happens.") "Other schools were stealing my ideas and choreography. We would go to a competition and see our work being performed! It was hard to believe people would do that. Finally, a judge came up to me and said "Why are you paying us? You should be getting paid." That was a light bulb moment and I decided our competition days were over. By 1995 Ann knew change was in the air. "By then we had about 100 students. I was 24 and knew I couldn't stay in the basement forever. So my parents and I started looking for a place to call my own." They drove all over the North side looking at possibilities. "Since I had students from the suburbs as well as the city, I thought it would be best to find someplace in between." Serendipity stepped in. One day they drove by a shopping strip on Northwest Highway where a large "For Lease" sign was in the window of an old pharmacy. Was this The Place? There wasn't much time to spare if the new studio was to open in time for fall registration. A decision had to be made. "I was terrified. This would completely change my life. I had to sink everything I had into this plus obtain loans. It was a huge financial risk." Ann's parents, Lisa, and Ann's soon-to-be husband, Jason, supported her venture. "My dad was so good. He walked me through all the business details and helped me design the studio. He was the one who could read the blueprints!" It was a scary, yet exciting experience. "I lost so much weight. I couldn't sleep. I had a knot in my stomach all the time." 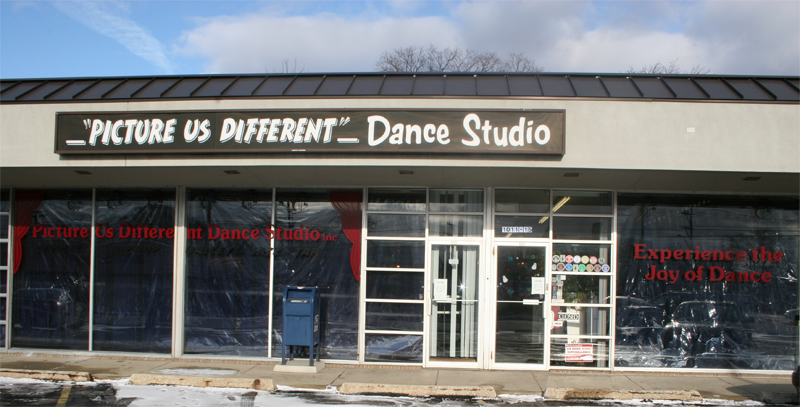 It all came together in September '95 when the Picture Us Different Dance Studio, Inc. opened for business. Nearly all (95%) of the basement students followed Ann and Lisa to Park Ridge. Of course, nothing of value ever comes—or remains—easy. Ann's reputation brought in more students, new classes were added, more teachers came on board. The annual productions played to bigger and bigger audiences. Ann wasn't prepared for some of the harsh realities of owning and running a business. "I had to learn the hard way about some things I took for granted. The creativity part of the business came naturally, but I had a lot to learn about the nitty-gritty of the business world." After a few years, Ann reached a low point. She was feeling a lot of stress and wondered if this was what she truly wanted. The doubt added to the pressure. "Then I got an offer to sell the studio. I was faced with another huge decision." More sleepless nights, more stomach knots. "My mom really helped me see things in perspective. She advised against any rash decisions." Lisa, as always, expressed her support for whatever path Ann would eventually take. "Ultimately, I had to face the fact that if I gave up the studio, then what? What would I do? I decided to keep going." With time and experience came some hard-won wisdom. Amidst all the business demands, Ann continued to train upcoming teachers according to her own distinctive dance philosophy. "I draw inspiration from the dance icons of the past, Gene Kelly and Donald O'Connor. I love their ability to evoke feelings of romance and humor through their dancing. Teaching dance technique is one thing, but it is a real challenge teaching a student how to project her unique personality through her dancing. If a student wants to pursue a professional dance career, she needs to project that dynamic of technique, energy and personality." On the studio's 20th anniversary, I asked Ann to sum up her thoughts: "I look back on these past years and I can hardly believe I managed to do all that. I still love the creativity of it all, the music, the costumes, the choreography. I'm glad I started this when I was young!" Her eyes are focused straight ahead; her feet tapping in perfect rhythm – but there is no music. Lisa is leading her class through a difficult sequence of a cappella tap. The trick is that the tapping should end a beat before the music starts up again. This represents what Lisa Terschl Dajani is famous for: exacting and challenging choreography danced as near to perfection as possible. Her high-energy choreography is singular; no one can match her creativity and style. Her students are lucky to have her as a teacher. I asked Lisa her thoughts on teaching. "This sounds incredible, but by age 10 I knew what to do and what not to do as a teacher. I was greatly influenced by my early dance teachers. It is necessary to engage students and offer a class that is fun but there must be a balance between having fun and learning – between love and discipline. There can be no compromise of one over the other." I asked about her approach to creating dances. "I choreograph from an audience's perspective. I want to keep them interested and excited about what's going on on stage. I also want us, as dancers, to connect with the audience." Did she ever consider any other career path? "No, I can honestly say that my only desire has always been to dance. I had opportunities along the way to dance professionally when I was with the Bulls and Wolves, and when I did various shows in Las Vegas. But my first commitment has always been to this studio. And I truly enjoy working with my sister. We don't even have to say anything most of the time, we know what the other is thinking." Ann emphasizes: "Lisa has been the most loyal sister, friend and colleague. She has never given anything but her best to this studio. With her talent for choreography and teaching, she is the complete package!" When preparing for an audition, a student will often ask Lisa for advice. "My professional experience has afforded me insight as to what a director is looking for. I'm glad I can take what I've learned and bring it back to the class." Her laugh precedes her. It is full and deep and a little rough around the edge, a result of hours of talking on the phone and to her students. Miss Kari appears with her arms full of papers and folders. She takes a break from her office managing and dance teaching to talk about her position as a "third sister." "Is that what Ann called me, really?" Yes, she did. "I am so touched and honored that she said that. Both Ann and Lisa have taught me so much about teaching and performing. They are the two most talented women I know." Kari was a new student in '95, although she had been taking classes for years before. "Believe it or not, I was very shy when I first came. Working here and becoming friends with Ann is responsible for my developing the personality I have – I guess it really rubbed off!" While in high school, Kari taught a Weeble Wobbles class and also worked the front desk once a week. When she was a senior, Ann gave her the responsibility of full-time desk person and also proposed that Kari start up a classical ballet class. "Ann knew I had years of ballet training and it was so exciting when she offered me the opportunity to start the ballet program here. I was exhausted going to school, then coming here to work and preparing for teaching my class. I had less than a dozen girls in that first class. I spent hours creating lessons, choosing music and doing research on the history of ballet. But I loved all of it and discovered I really liked the business end of it, too." Ann adds: "I was amazed at this young girl and how intelligent and focused she was. She took notes when I spoke with her!" Kari's classes have been a success. There are now almost 100 girls in Classical Ballet and Miss Krystle has joined Kari in teaching them. When Kari graduated, Ann asked her if she would like to be a permanent office manager. "Of course I said yes! I was driving my counselors crazy because I had no plans for college. They were quite patronizing; they didn't understand that I had essentially been training for my career since I was 11 years old." Kari is obviously happy with her decision. "I love my girls! I enjoy helping them develop an appreciation for the art form I love so much. It's my goal to teach them good technique, and how to avoid injuries. I want them to feel good about what their bodies can do. And I am always available for them if they need to talk. I don't judge and I'm a good listener." I have discovered that "different" refers not only to the performing, but the idea of teaching from both the head and the heart. This difference is reflected in all the smiling faces of the dancers of Picture Us Different.